Ultra-original and easier to wear that one might imagine, polka dot socks are quickly becoming a classic. Whether in contrasting colors or more subtle compositions, polka dot socks range from discreetly elegant to pop chic. A new essential in your sock drawer. 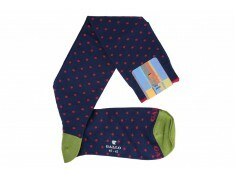 https://www.uppersocks.com/2090-product-list/socks-gallo-spots-navy-fuchsia.jpg Gallo socks in navy blue with fuchsia spots. Gallo socks in navy blue with fuchsia spots. Discover these knee-length navy socks with fuchsia spots, made in Italy by Gallo. They are cotton, available in sizes 40-45. These cotton knee-high socks are made by Gallo. They are denim blue with sky-blue spots The socks are available in one size, 40-45. 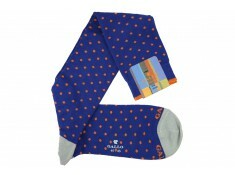 Check out these Gallo socks, royal blue with orange polka dots. They are made in Italy, are made of cotton, polyamide and elastane, 33 euros. 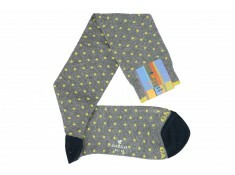 Enjoy these Gallo socks, gray with yellow polka dots. Manufactured in Italy, they are mainly made of cotton, 33 euros. 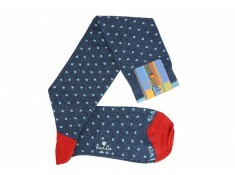 Treat yourself to a pair of navy blue, green polka dot Gallo socks. Made from coton and polyamide. These comfortable socks will go with any outfit! Available in one-size.